A solar powered air conditioner is an Aikido throw against the sun’s attempt to bake you inside of your house. These systems let you take all those sweat-producing solar waves and transmogrify them into cool air. This is still an up-and-coming technology, so you can’t pick one up at your local Target quite yet — but it has the potential to change how homes stay cool. If you want to get on the bleeding edge of summer-beating technology, you have options. Here are the three types of solar powered air conditioners available right now. This the most common type, and they use Brushless DC compressors, or standard type compressors, to generate cold air. Like almost all devices that rely on solar power, these units turn solar radiation into DC power. Some units are able to use this DC power, while others use an inverter to turn that energy into AC power. 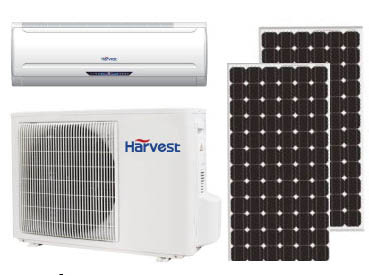 There are three types of PV AC units. These don’t require an inverter, as all components run on DC power. The main advantage of this type of solar air conditioner is that there is no wasted energy spent converting the DC power into AC power. The manufacturer Harvest produces a number of these units. These are units that use AC power for some components, and DC power for others. These are the least common. One of the most popular brands right now is Lennox. This is a unique system patented by Solar Cool Energy. Bonus: this system can also be used to heat a home. These types of units are only designed for commercial buildings, so they aren’t an option for your home. But if you own a company that has to chill massive amounts of cubic footage, this might be a money saver for you. Solar powered chillers essentially run off steam or hot water that might be generated in a number of ways, including solar energy. One major brand in this area is Robura, which produces air conditioning units for hotels and other large buildings. If you want to go this route, talk to your salesperson about coupling your large-scale chiller with solar power. They’ll be able to help you understand what your options are. While households who opt for solar powered air conditioning units can cut down on their personal home budget, giant buildings that go solar will have a much bigger impact. And it doesn’t come any bigger than shopping malls. Around 60%of the power used by these consumer meccas go straight into keeping shoppers cool. But there’s even a solar solution for businesses that have huge AC needs. An Australian shopping center in Ballarat, Victoria called the Stockland Wendouree Shopping Centre recently installed a solar system. It was partly funded by the Australian Renewable Energy Agency (ARENA) program. The system captures solar heat in a 2,000-liter thermal oil tank. In the summer, the heat is used to power an indirect evaporative cooler. In addition to being more energy efficient, the entire unit is 40% smaller than a typical system. This is an exciting development, because it means an end to the Sun’s 4.5 billion year long record of using its rays to only heat the Earth. As all these systems become smaller, cheaper, and more efficient, soon we’ll all be able to turn that heat into cold. "A solar powered air conditioner is an Aikido throw against the sun’s attempt to bake you inside of your house." Low flow toilets save money and put less pressure on your local water supply.